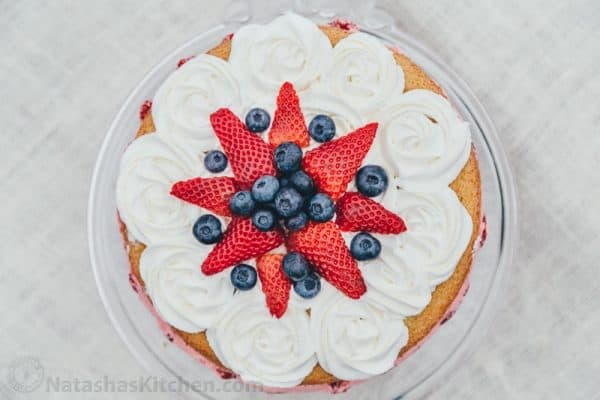 The strawberry jello filling sandwiched between the Russian biskvit cake layers is quite memorable and as my sister put it, “this is the stuff my dreams are made of;” that pretty much sums it up! 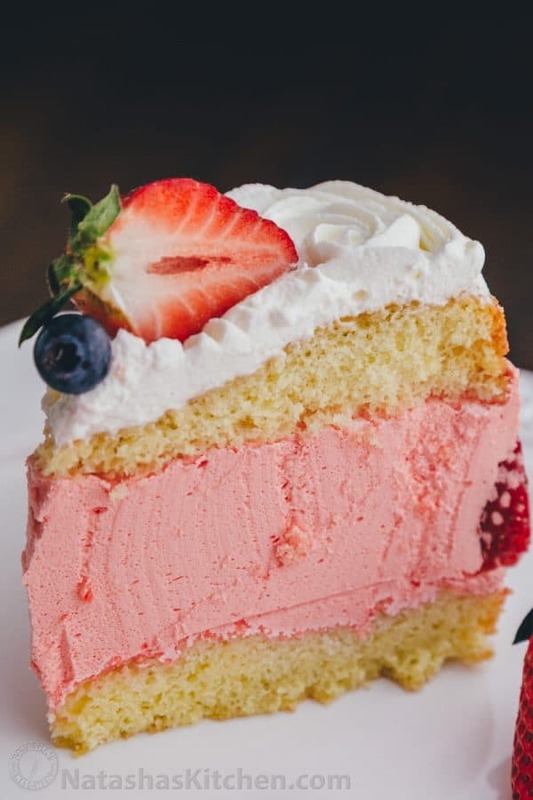 You can easily make this Strawberry Jello Cake your own by changing up the flavor of the jello and top with different berries. Laura K., one of my friends from church graciously shared this recipe with me. She brought it to a church potluck and it was deeee-licious! I was so surprised how easy the strawberry filling was to make. Unfortunately for me, I made the first cake on Thursday and went on to eat way too much of it. 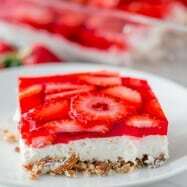 I made a second Strawberry Jello Cake on Saturday (of the same week) for a family dinner; it was devoured. And out of the corner of my eye; I caught a stand-off for the last slice; my pregnant sister won of course. Anyway, not a crumb left behind. 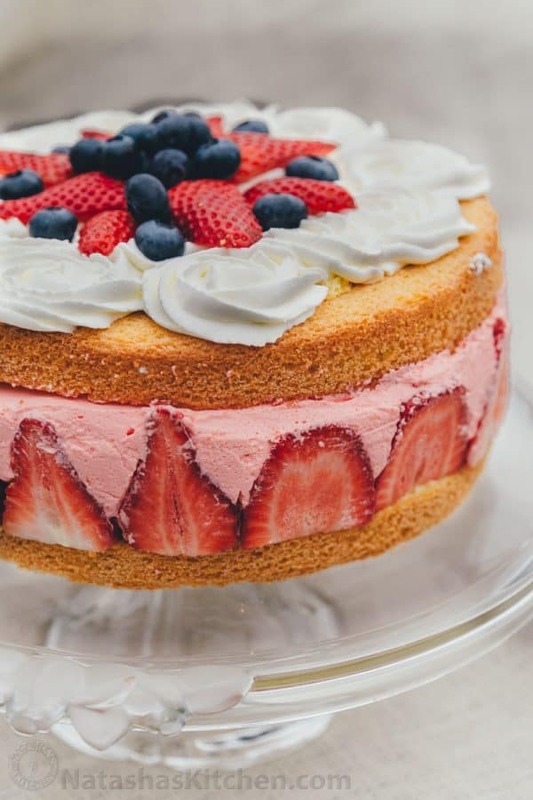 Laura makes this cake in a 13×9 glass pyrex dish so you can see the jello layers through it; probably a more practical way to make this cake; Thank you Laura for this amazing recipe. My entire family loved it! 1/2 cup blueberries, or whatever fruit you have on hand. 1. 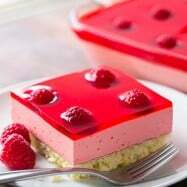 In a large mixing bowl, make jello according to the instructions on the package, but use 1/2 of the cold water. I.e. for a 6 oz package of jello, add 2 cups boiling water and 1 cup cold water. 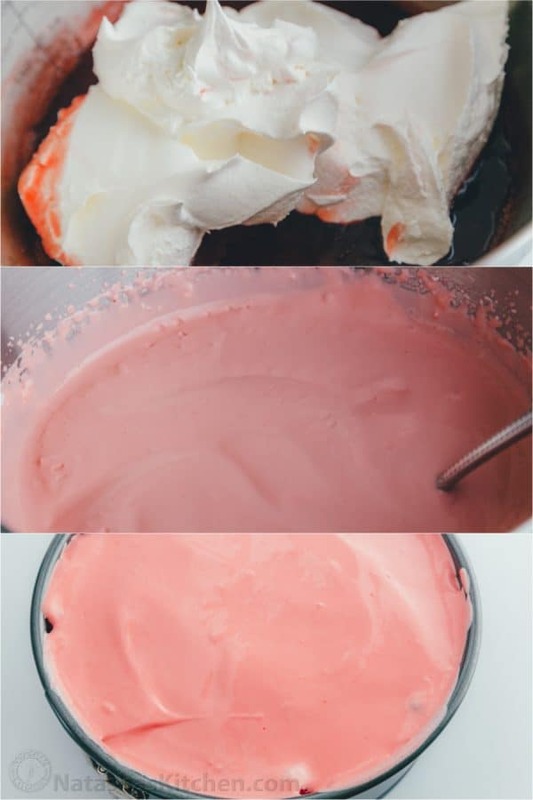 Let Jello sit at room temperature until it is soft set and jiggles a little (while you work on the rest of the cake), then beat in thawed 8oz cool whip (see step 7 for the cake layers). 1. 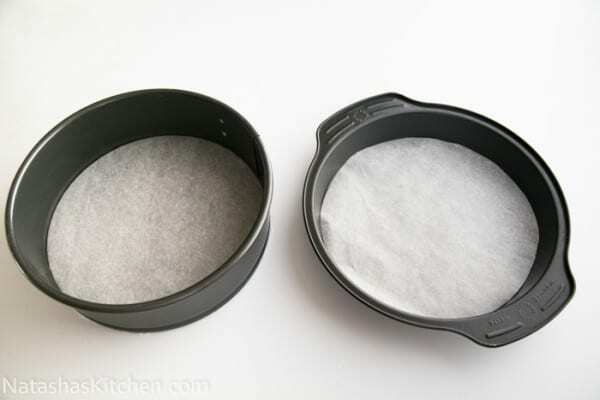 Line two 8″ or 9″ round cake pans (ideally one should be a springform pan) with parchment paper. (Note: If all you have is a spring form pan, you can bake the batter in the springform and then cut in half when it cools, but you will have better, fluffier results if you divide it between two cake pans; I tested it both ways). 2. 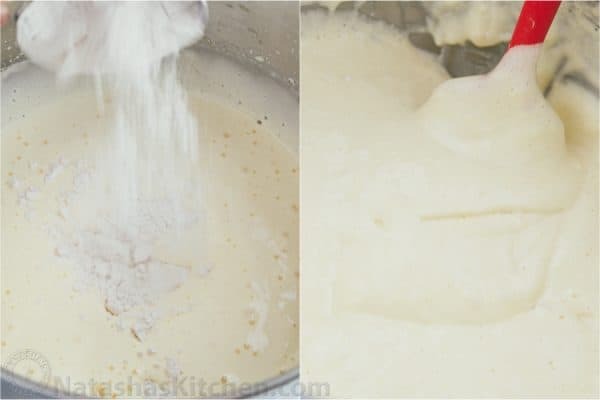 In the bowl of an electric mixer with the whisk attachment, beat together 6 eggs and 1 cup sugar on high speed for 12 minutes or until 3 times in volume and thickened. 3. Sprinkle flour over the top and use a spatula to gently fold in 1 cup all-purpose flour until all lumps are gone (the flour tends to congregate on the bottom so make sure you stir from the bottom up and scrape around he edges of the bowl). 4. Divide your batter in half between the 2 lined baking pans and bake at 350˚F for 16-20 min or until top is golden brown and toothpick comes out clean. 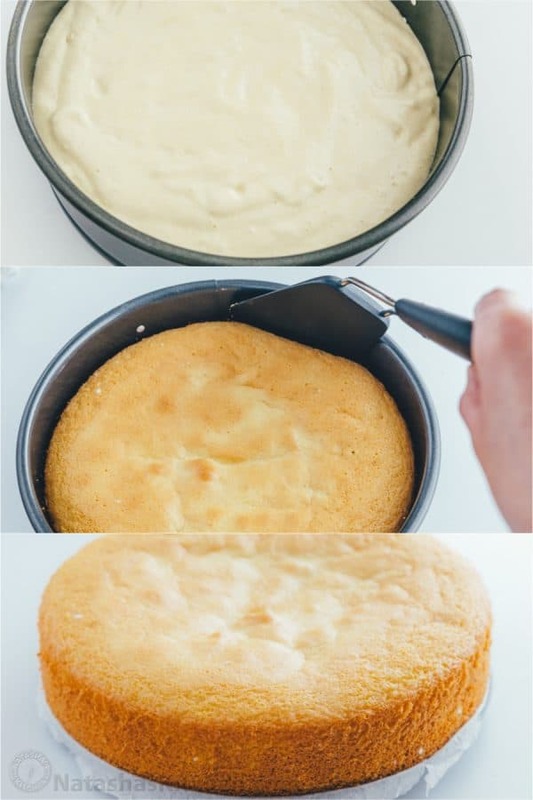 Remove baked cake from the pan being careful not to squish the top (use a plastic knife or a thin spatula to release the edges from the pan) and let it cool to room temperature on a wire rack. Wash the springform pan. 5. Once your cake has cooled, place the skinnier layer back into the bottom of your springform pan. 6. Slice your strawberries in half (or thirds if they are very large) and place them facing tightly against the walls of the springform pan. 7. At this point, you’ll want to beat 8oz cool whip into your jello which should be starting to thicken. 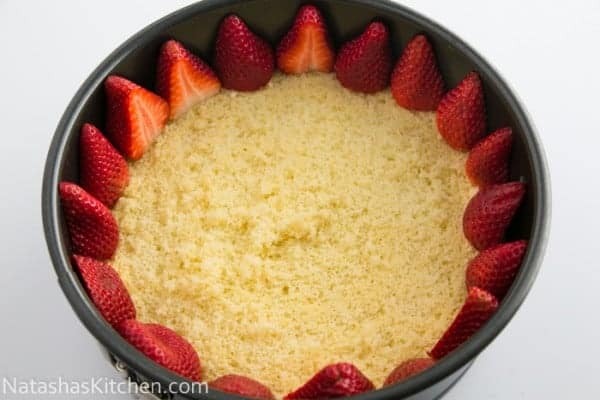 Pour your jello cream over the bottom cake and strawberries being careful not to knock down the strawberries. Smooth over the top. 8. Place the top biskvit layer over the top and Refrigerate for 2 hours or until jello is set then remove from fridge to decorate. I made roses using a Wilton 2D tip. Start in the center and work your way out in circles; staying close to the surface of the cake. It’s really pretty easy to do, but practice a couple on a plate before you turn your cake into a Picasso ;). Pile fruit in the center in whatever design you like; they look good just piled up too. Put back in the fridge a couple more hours or overnight to allow the jello to fully set before serving or the cake will be too dainty and will fall apart easier when sliced. 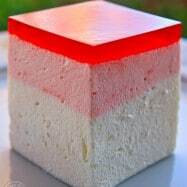 Also, you take it out of the spring form mold, fold some plastic wrap and wrap it around the jello part of this cake to keep it in place while it firms up fully. The second time I made this cake, I lined the walls of the spring form mold with plastic wrap for easier release, but even without plastic wrap, it cut away from the springform pan pretty easily. Also, the second time I didn’t put strawberries along the walls and jut made a plain jello layer with strawberry slices on top of the jello; the big strawberries make it hard to slice, but they are pretty; it’s a trade-off). You’ll love this cake. It’s the good stuff. In a large mixing bowl, make jello according to the instructions on the package, but use 1/2 of the cold water. I.e. for a 6 oz package of jello, add 2 cups boiling water and 1 cup cold water. 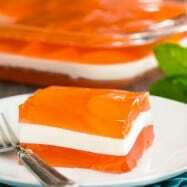 Let Jello sit at room temperature until it is soft set and jiggles a little (while you work on the rest of the cake), then beat in thawed 8oz cool whip (see step for the cake layers). Line two 8" or 9" round cake pans (ideally one should be a springform pan) with parchment paper. 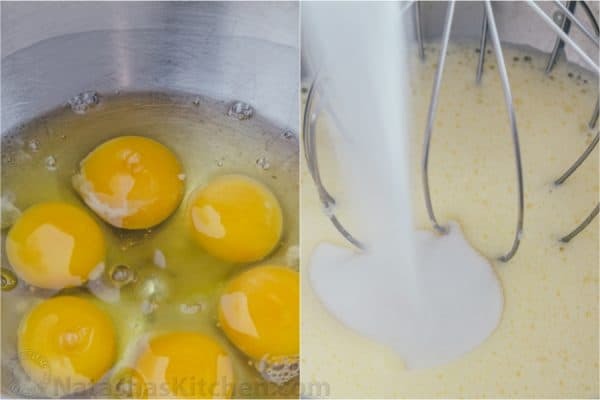 In the bowl of an electric mixer with the whisk attachment, beat together 6 eggs and 1 cup sugar on high speed for 12 minutes or until 3 times in volume and thickened. Sprinkle flour over the top and use a spatula to gently fold in 1 cup all-purpose flour until all lumps are gone. Divide your batter in half between the 2 lined baking pans and bake at 350˚F for 16-20 min or until top is golden brown and toothpick comes out clean. Remove baked cake from the pan being careful not to squish the top and let it cool to room temperature on a wire rack. Wash the springform pan. 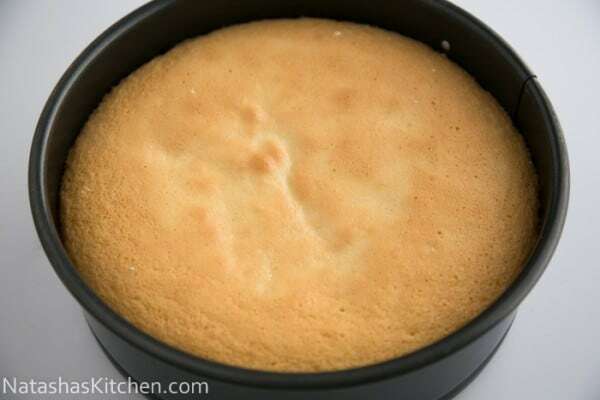 Once your cake has cooled, place the skinnier layer back into the bottom of your springform pan. 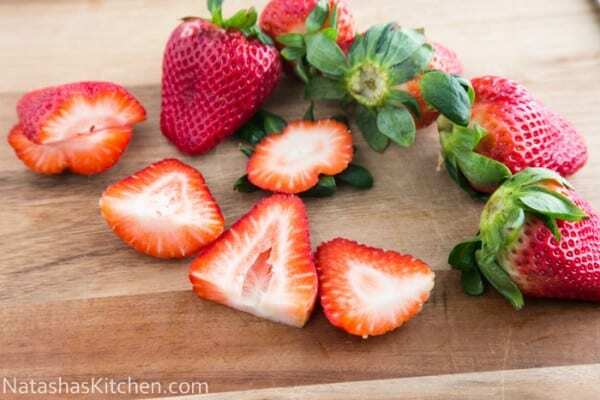 Slice your strawberries in half (or thirds if they are very large) and place them facing tightly against the walls of the springform pan. At this point, you'll want to beat 8oz cool whip into your jello which should be starting to thicken. 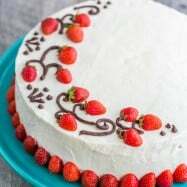 Pour your jello cream over the bottom cake and strawberries being careful not to knock down the strawberries. Smooth over the top. Place the second cake layer over the top of the jello and refrigerate for 2 hours or until jello is set then remove from fridge to decorate. I made roses using a Wilton 2D tip. 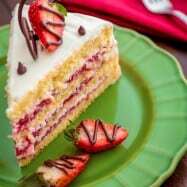 Start in the center and work your way out in circles; staying close to the surface of the cake. Pile fruit in the center in whatever design you like; they look good just piled up too. Put back in the fridge a couple more hours or overnight to allow the jello to fully set before serving or the cake will be too dainty and will fall apart easier when sliced. 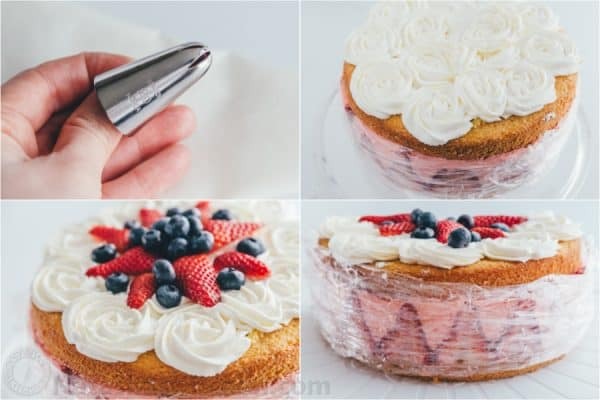 Also, you take it out of the spring form mold, fold some plastic wrap and wrap it around the jello part of this cake to keep it in place while it firms up fully. Natasha i am in process of making this cake now. Im a bit scared or worried. So i made the jello with 8oz cool whip, mixed it, and followed ur instructions, but my jello mix with cool whip came out watery. Is that normal? Thank you for this wonderful blog and this recipe in particular! I made this cake once for my husband’s office people and everyone loved it! Pretty easy to make for a beginner like myself. Now I would like to make it for my son’s Baptism celebration. How many days in advance can I make it? For example, if I need it for Sunday, is it OK to make it on Friday? I just worry that strawberries around the cake will start going bad. What do you think? I just made this and it looks wonderful! I can’t wait until it’s set. For people asking, 8 oz of Cool Whip is the same as 1 L. And, 6 oz of Jello is the family-size pack (or 2 of the small packages). I only had 1 small strawberry jello, so I used a raspberry jello package too. All your recipes are super! I was wondering if there is a difference between using parchment paper and bakers spray? I have always been using the spray, and now looking through all of your recipes wondering if using parchement paper gives you better results? Thanks natasha! By the way, Alina’s tip about pinneaple juice really works, I think it turned the cake doubly delicious…. I love your web. This looks amazing! I love your recipes! 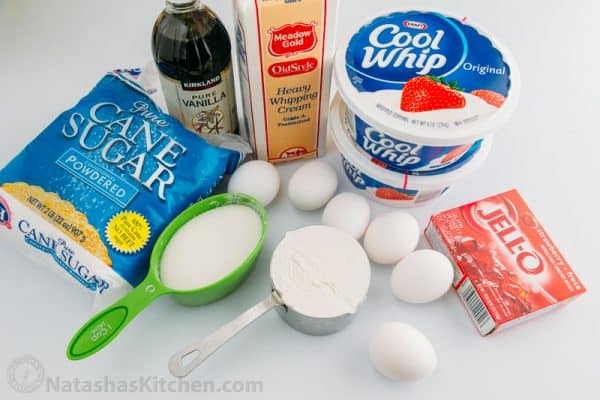 One question – what is Cool Whip? I don’t think we have this in Australia. Is there something than can be used instead? Looks delicious and great tip choice! I’m a frosting fanatic, do you think I can somehow add more without “overdoing” it?